“By showcasing Trainer Rx at HIMSS, we demonstrate the platform’s ability to disrupt the healthcare rehabilitation ecosystem,” said Michael Oberlander, MD, president and chief medical officer of Trainer Rx. Trainer Rx, a leading mhealth innovator, will showcase its telerehabilitation (telerehab) platform at the Intelligent Hospital™ Pavilion (IHP) during the HIMSS 2018 Conference & Exhibition at the Sands Expo Center in Las Vegas, NV. HIMSS, which stands for Healthcare Information Management Systems Society, runs from March 5 - 8. The IHP is the destination for live demonstrations of the latest technologies in the healthcare ecosystem. HIMSS attendees will experience the Trainer Rx platform (booth #11657-11), which is designed to help patients recover from orthopedic injuries through pre- and post-surgery rehabilitation at home. Trainer Rx, along with Phillips, Bodimetrics, and other innovative digital health companies, will be showcasing their transformative technologies as part of IHP. 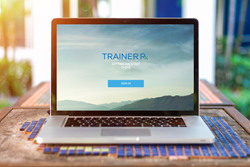 Trainer Rx uses an intelligent design, cloud technology that patients can access anytime, anywhere, and in any device. Like most physical therapies, the platform is first prescribed by providers but then can be utilized by patients for up to a year for one low fee. Providers can view patient adherence and outcomes data in real time, and the platform integrates with EHR systems, including Athena Health. Patients who utilize Trainer Rx for recovery after injury have reported statistically significant pain reduction. For example, those who received hip arthroplasty and used the Trainer Rx platform for rehabilitation reported a 45.9% reduction in pain score using the visual analog scale (VAS Pain). The Trainer Rx platform (booth 11657-11) will be featured in six scenarios at IHP where attendees will learn how the telerehab platform is applied, starting at Prehab, Post-Operative Recovery, and then moving to the iHome Suite Living Room (remote care devices and “smart” home technologies). The scenario demonstration ends at the Doctor’s Office for follow-up care. Knowledge Theater: Dr. Mike Oberlander, Orthopedic Surgeon, founder and president of Trainer Rx will present on the topic, “Beyond Paper: Evidence-Based Telerehab" on Wednesday, March 7 from 11:30-11:50 a.m. PT. Innovation Theater: Dr. Ed Brown, founder and CEO of the Ontario Telemedicine Network, will moderate a panel discussion called “Designing for the Patient: Tips, Experiences in Digital Health." Panel presenters include Trainer Rx, Cirrus MD, Masimo and iRXReminder on Wednesday, March 7 from 5 to 6 p.m. PT. HIMSS 2018 Conference & Exhibition brings together more than 45,000 professionals globally to help uncover the promise of health information and technology. #TrainerRxTelerehab at #HIMSS2018. For more information, visit http://www.TrainerRx.com or call: 1-833-LIVE-TRX (833-548-3879). Outcomes Focused. Evidenced Based. Consumer-Centric. Since 2014, Trainer Rx is a leading innovator in musculoskeletal mhealth solutions. The platform is designed to aid in the prevention and recovery of orthopedic injury and surgery. Patients have completed more than 600,000 rehab sessions, enabling providers and health systems to review patient-reported outcomes measures and risk manage patients to recovery. The combination of in-clinic and home-based rehabilitation content and educational material improves education of injury and treatment options. The customizable platform optimizes cost-efficient, high quality, and accessible healthcare. Patients on average use Trainer Rx for 91 days (26 sessions). The product boasts an 87% Net Promoter Score. Visit http://www.TrainerRx.com.